Whether you’re about to expand into your second, third, or tenth sales channel, your systems need to be ready. 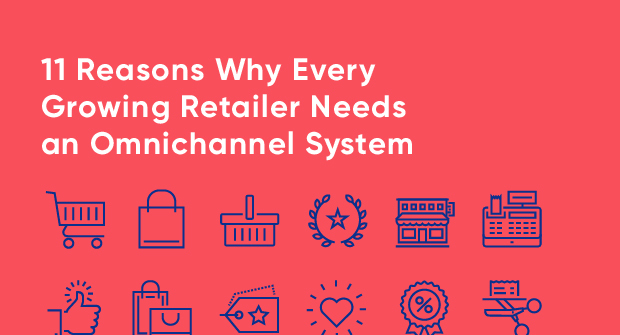 In this white paper, you’ll find the top 7 reasons why a multichannel retail system is critical to your success, and your sanity. But with new channels come new challenges. Your systems have to be ready to handle separate orders, prices, inventories, and even brands. Integration and automation are key. In this white paper, you’ll find the 7 reasons you need a multichannel system—a central command center that coordinates all of these activities—to ease your expansion. A multichannel retail, or hub, system houses all of your orders, inventory, customer data, accounting, and reporting—so you can view and manage everything in real-time from a single, integrated solution. Here are the top 7 reasons you should implement one now. Greater control over your data. Multichannel systems keep product information including names, descriptions, attributes, and images—all tracked under stock keeping units (SKUs)—in one master list that’s easy to manage. No matter how many sales channels you enter, this makes it faster and easier to keep track of your product information. The more channels you trade in, the more complicated it gets when products are added or sold. But if you have a multichannel system, it synchronizes your inventory across channels in real-time. This helps you: Maximize sales—When new inventory is delivered by your suppliers, multichannel systems inform all sales channels quickly so they can start selling. Prevent double-selling—When a product is sold on one channel, hub systems mark it as allocated—and remove it from the on-hand inventory of all channels. Different customers frequent different sales channels, so as you add channels, you may need to price your products differently, too. eBay and Amazon shoppers, for example, are more price sensitive than many in-store customers. Managing separate pricing models is no problem for hub systems, which either allow distinct price lists or apply discounts based on rules you set up. This helps you price your products perfectly for each audience. Every sales channel handles tax differently, making your job more challenging as you expand. But if you use a multichannel system to integrate and automate taxation, you’ll be able to manage most any scenario. Just enter tax-exclusive (net) prices, and then set up rules to add tax as needed for each channel. The hub system will either have accounting built-in or store detailed tax information for easy transfer into your accounting system. A single view of all orders. Improve efficiency—With all orders in one place, your team has just one place to go to complete most any task. Stay informed—You can check that system for what’s in progress, on hold, and on back order. Plus, you’ll see when you’re running low on inventory so you can place new orders. Get tax right—With a hub system, your orders are downloaded from the sales channels with the right tax amount and tax codes, so the numbers transferred to your accounts are correct. Multichannel systems integrate directly with carrier systems to speed up sales data transfer and shipment processing, which is essential when you’re doing business in several channels. This integration also eliminates manual data entry into the carrier system, so shipments go out with fewer mistakes. And it saves you from manually moving tracking references that need to be communicated to the customer—for a smooth-running, automated shipping process. In a multichannel system, you can assign different brands to different channels—a common need for retailers who expand. This ensures that your invoices and other customer communications display the correct trade name, company logo, and email address for a consistent brand experience. Happier customers and more positive reviews. As your omnichannel retail system updates your stock levels across your multiple channels quickly and seamlessly; tracks your gift messaging requests on orders and enables you to ship packages out of your door faster and with less human error; it is expected that your customers will be happier with your service and more likely to write positive reviews. Gone will be the minutes, hours, days you spent on trying to turn a dissatisfied customer around and instead, you can spend this time and resource on growing as a business and doing more of what you love. The best omnichannel systems will offer you an integrated POS solution. You might already be selling your products offline or maybe you’re considering expanding into a brick and mortar store. Whatever stage you’re at with your point of sale, your omnichannel system should seamlessly integrate it into the rest of your business. Inventory levels will be updated in real time (particularly important when you have a queue of shoppers in your store); accounting transactions will be logged in real time, and you will have a full history of your relationship with that customer to hand. With offline capability also included, you won’t have to slow down if your internet slows or shuts down completely. Which means you can go back to focusing on what store displays to use and how best you can market your excellent in-store shopping experience to your target audience. Automated workflows to save you time. An excellent omnichannel system will offer you the opportunity to design, establish and fine-tune your workflows and then automate them to save on time and costs. With the everyday processes automated, errors can be eliminated; giving you more time to handle exceptions and focus on growth. By automating your workflows, there’s less need to do boring admin such as sending orders to the warehouse or logging consignments with carriers, resulting in you being able to cut additional costs and redeploy your team to the areas where you need them the most. Automate your entire retail business and reap the rewards of more time and money to spend on growth activities. More opportunities to expand internationally. Whether your website alone caters for international customers or whether you are on a mission to expand into overseas markets through use of online marketplaces; your omnichannel system will support your business growth. With orders downloaded in real time and easily filtered based on country; with shipping carriers updated instantly and the all important tax rules being easy to setup; your omnichannel system will work seamlessly with your international expansion plans. This leaves you free to focus on how best to expand into those overseas markets and focus on your business success. When business is spread across multiple channels, all its elements—orders, inventory, shipments, and more—still have to be managed centrally, either through huge manual efforts or integrated multichannel retail systems like Brightpearl. Choosing systems saves you time and prevents errors, ultimately providing the control and confidence you need to thrive, no matter how many channels you’re in.